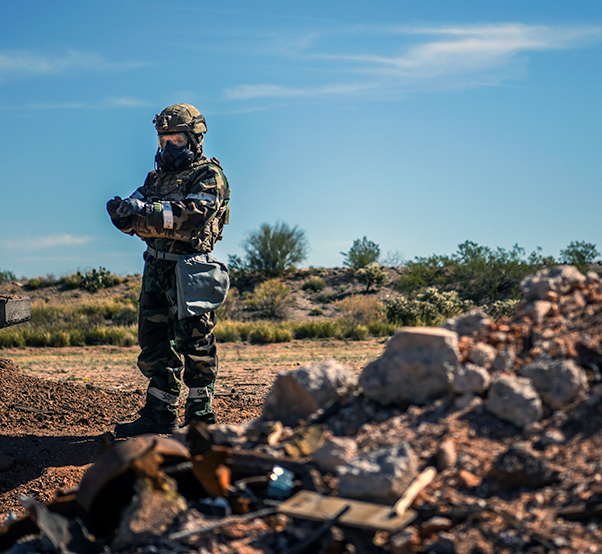 A U.S. Air Force explosive ordnance disposal technician from the 355th Civil Engineer Squadron assesses the fallout of a disarmed improvised unexploded ordnance during a training exercise at Davis-Monthan Air Force Base, Ariz., March 28, 2018. The exercise involved the discovery, assessment and disposal of unexploded ordnance on a mock runway. The 355th Civil Engineer Squadron participated in an airfield damage response and assessment exercise at Davis-Monthan Air Force Base, Ariz., March 28-30, 2018. The exercise was held to evaluate their response to a damaged airfield in a simulated deployed environment. 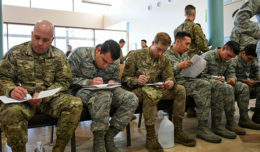 The exercise required all CE flights to work together towards a common goal. “This is a monumental occasion to be able to get all the puzzle pieces together,” said Lt. Col. Matthew Beverley, 355th CES commander. The exercise began with an airfield damage assessment. 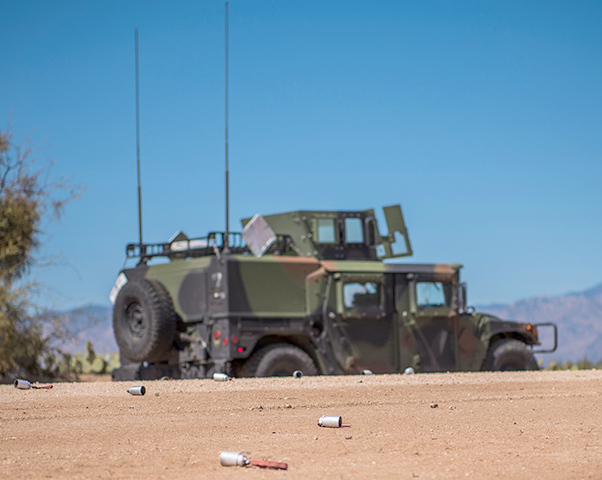 A team comprised of an engineering technician specialist and EOD technicians, designated where comprised damage and unexploded ordnance were then relayed the information to the emergency operations center. 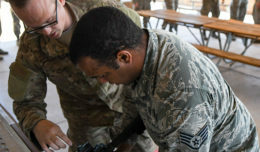 An airfield damage assessment team from the 355th Civil Engineer Squadron, assesses the damage caused by a simulated improvised explosive device during a training exercise at Davis-Monthan Air Force Base, Ariz., March 28, 2018. The exercise involved the discovery, assessment and disposal of simulated unexploded ordnance on a mock runway. After discovering and assessing the ordnance, EOD technicians must disarm them while limiting airfield damage and maintaining air mobility. After the damage was assessed, pavement and construction equipment and structural specialists tested their abilities by filling and repairing damage caused by the simulated explosions from UXOs. These tasks can only be completed by the different career fields of CE working together, and the end result better prepares them for the skills and readiness needed in a real-world scenario. 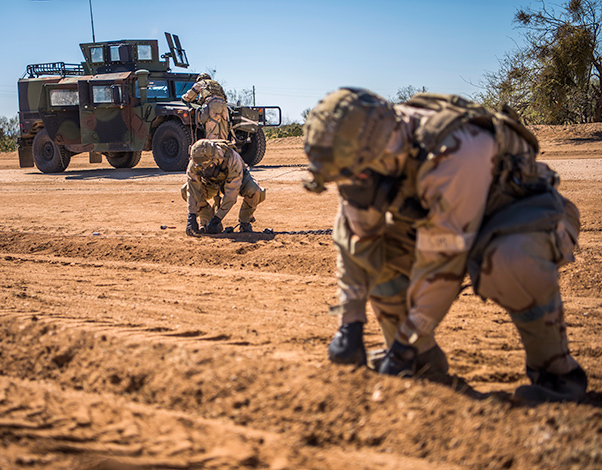 U.S. Air Force explosive ordnance disposal technicians from the 355th Civil Engineer Squadron assess, mark and remove simulated unexploded ordnance during a training exercise at Davis-Monthan Air Force Base, Ariz., March 28, 2018. 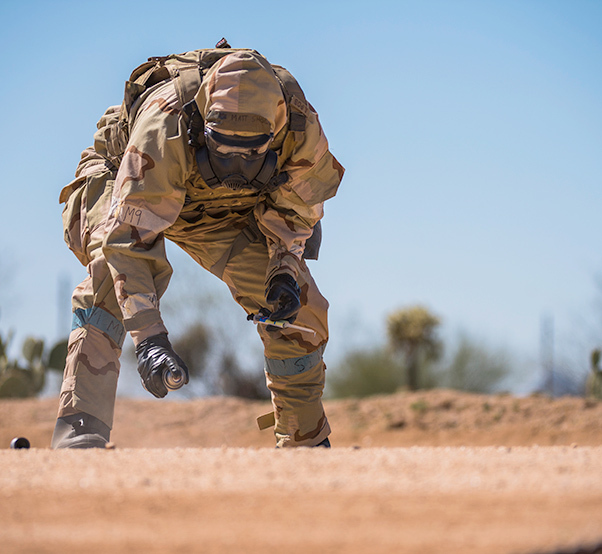 A U.S. Air Force explosive ordnance disposal technician from the 355th Civil Engineer Squadron cordons an area containing simulated unexploded ordnance during a training exercise at Davis-Monthan Air Force Base, Ariz., March 28, 2018. Staff Sgt. 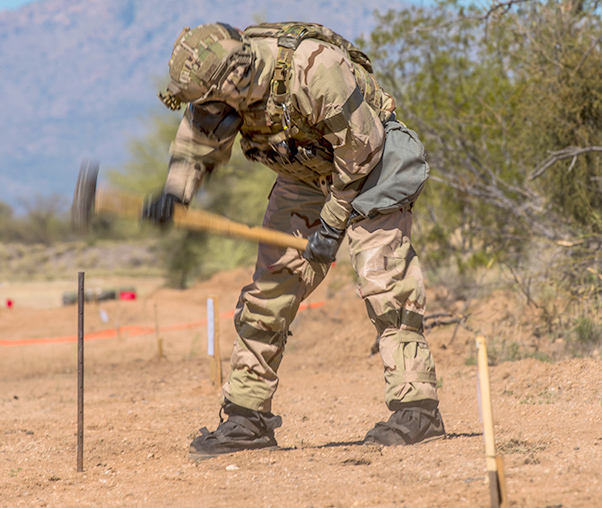 Matthew Shoup, 355th Civil Engineer Squadron explosive ordnance disposal technician, assesses and marks simulated unexploded ordnance during a training exercise at Davis-Monthan Air Force Base, Ariz., March 28, 2018. 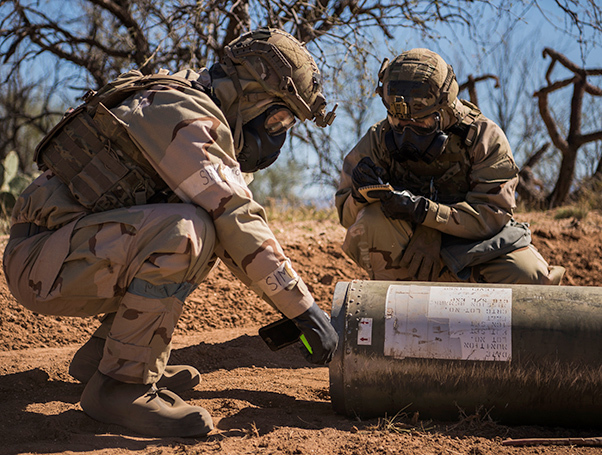 Two U.S. Air Force explosive ordnance disposal technicians from the 355th Civil Engineer Squadron analyze and measures a simulated unexploded ordnance during a training exercise at Davis-Monthan Air Force Base, Ariz., March 28, 2018. 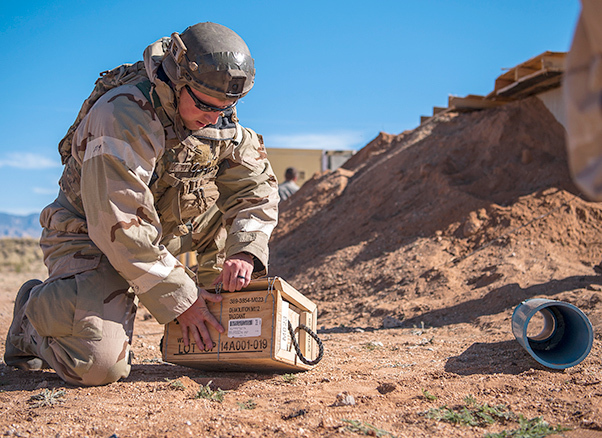 A U.S. Air Force explosive ordnance disposal technician from the 355th Civil Engineer Squadron opens up a box of C4 plastic explosives during a training exercise at Davis-Monthan Air Force Base, Ariz., March 28, 2018. U. .S. 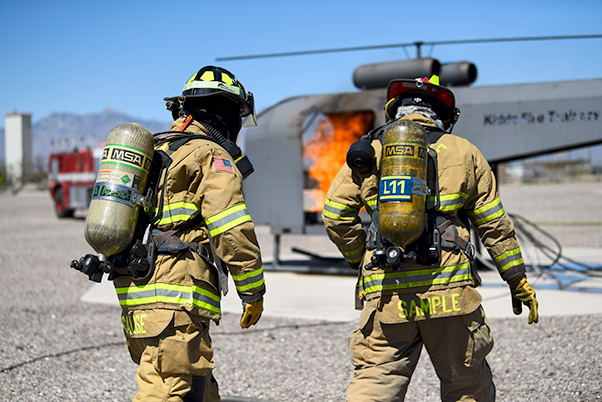 Air Force firefighters extinguish a fire during a training exercise at Davis-Monthan Air Force Base, Ariz., March 28, 2018. 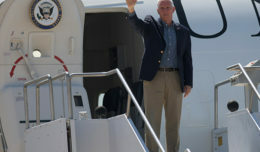 The exercise was held to test CE’s readiness in a simulated deployed environment.